MWN Blog: It's November? Where did fall go? We've had a nice little run of fall weather lately with a mix of cool and warm temperatures that seem to average out to about what most people expect this time of year. Yeah well... you can forget about all that for the next several days! 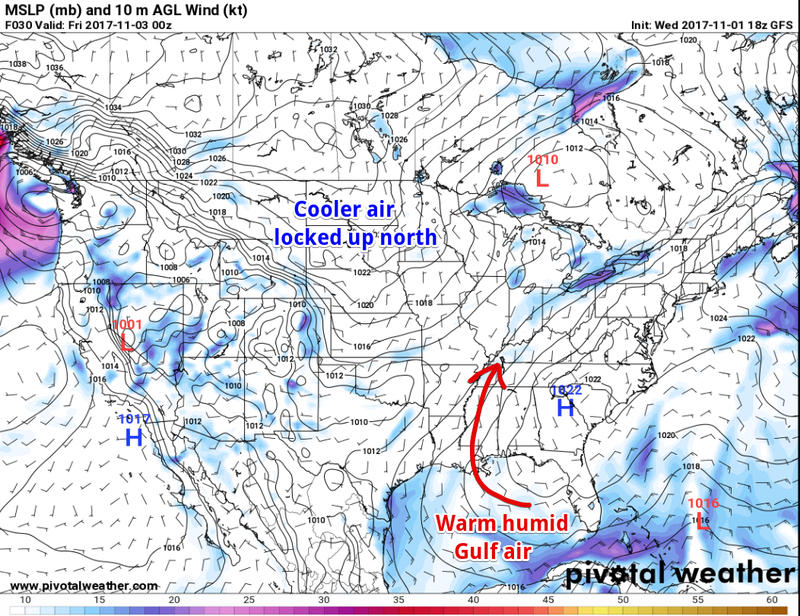 High pressure aloft will strengthen over the Gulf of Mexico and far southern U.S. into Mexico, forcing the jet stream well to our north. 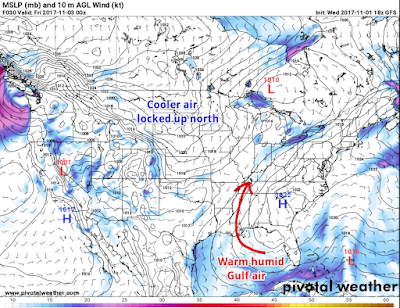 At the surface, high pressure will build into the southeastern U.S. from the Atlantic, setting up a good fetch of warm air from the Gulf into the Mid-South. 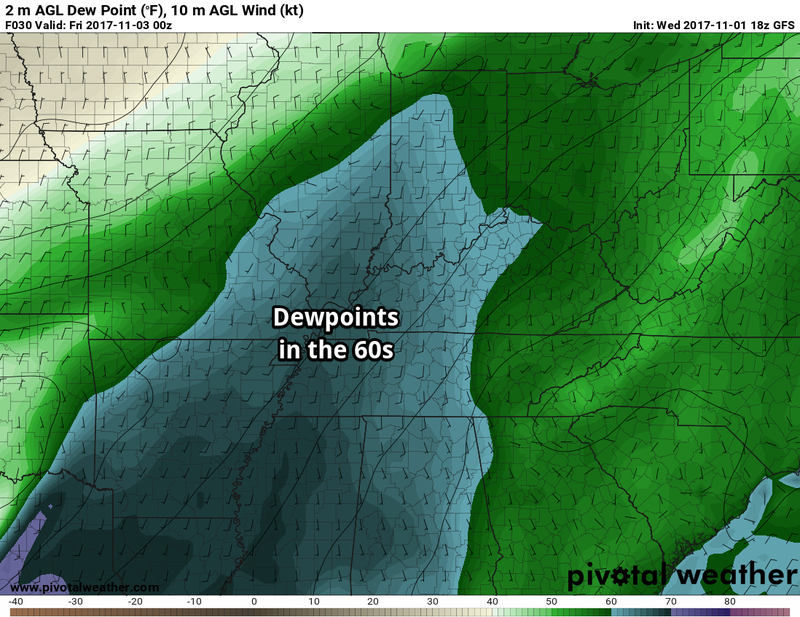 While a front will attempt to move into the Mid-South from the north on Friday, it will stall to our north, blocked by the edge of the high pressure area over our region. Combined, the result is well above normal temperatures for several days. The warm weather started to creep back today as a warm front lifted to our north, shifting the wind to the south, escorting in moister air (higher dewpoints in the lower 60s versus 30s and 40s of late), and thus warmer temperatures. Even despite cloud cover all day and a few light showers around, the mercury still rose to the upper 60s. We'll have low chances of showers daily for the next few days with the best chances being Thursday night into Friday, though still only 40-50%, as minor waves in the upper levels move through and trigger possible showers. An isolated thunderstorm can't be ruled out Friday as well. By Saturday, the surface high establishes itself a bit more and rain chances dwindle to just a slight (20%) chance. That trend continues into early next week. A loop of forecast precipitation from the GFS model through Monday shows scattered chances several times between now and then. The primary rain chances will be Thursday night into Friday with a drying trend this weekend. As for temperatures, if you really like cool, crisp fall air, look away! The highs, and especially the lows, will be far from that. Normally we average upper 60s for high temperatures this time of year and upper 40s for lows. You can add about 10° to those average highs as we will likely reach 80° at least once if not a couple times in the next 4-5 days (starting Thursday). Overnight lows will be very mild as well, owing to the warm moist air and cloud cover. 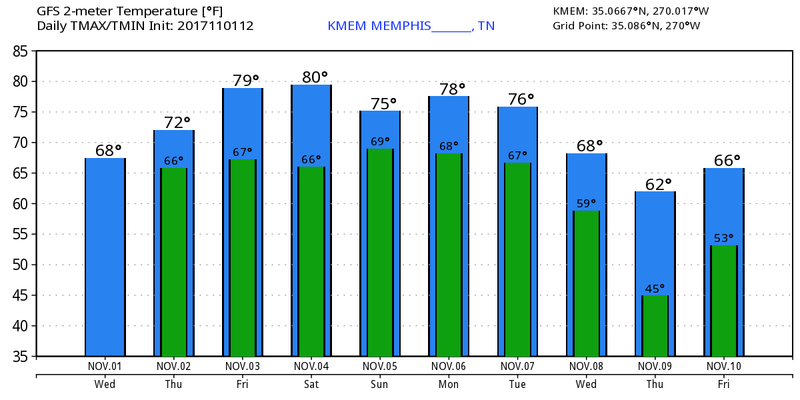 Look for wake-up temperatures in the mid 60s each day into early next week. Looking ahead, the high should begin to break down, allowing a cold front to finally move through the Mid-South by Tuesday or Wednesday of next week. 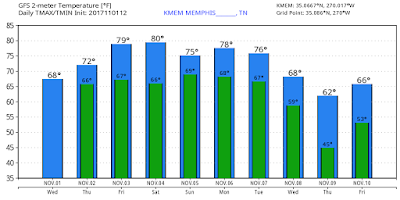 That would push us back toward the "normal" range for temperatures and bring our next best chance of widespread rainfall of the measurable variety. Hopefully then we can get back to more "fall-like" weather! 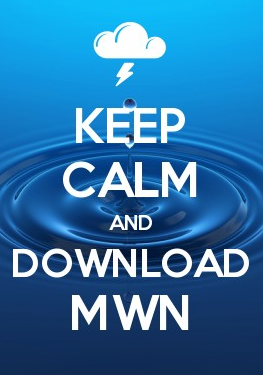 Check for the latest updates to the MWN Forecast anytime using your MWN mobile app and follow us on social media for the latest info! Pertinent links can be found below.